Unfriended: Dark Web shares the same filmmaking style of its 2014 predecessor, Unfriended, where everything the viewer witnesses takes place over video chat between friends from the perspective of the lead character’s desktop screen; however, that’s where the similarities end – which is a good thing. Take the Paranormal Activity franchise for example: the first film was fantastic, intriguing, and stands alone quite well, but instead of just taking the found footage premise and creating individual stories of demonic possession or the likes for its sequels, the series instead chose to find ridiculous ways to connect each of the five films that followed the first to that original story as though it was some epic tale, when really it just hindered the franchise as a whole. 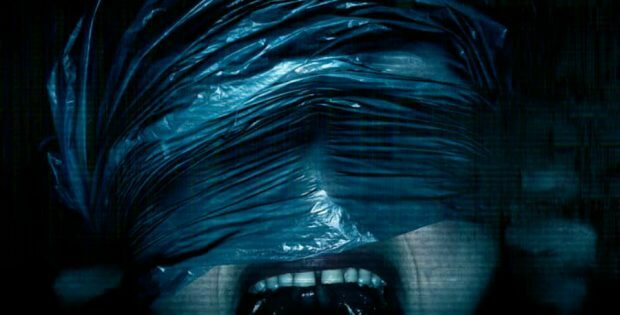 Unfriended: Dark Web does the opposite, tossing aside the more supernatural elements that were found in the first film and instead telling a story based somewhat more in reality, focusing on the great unknown that is the dark web. Now, I will say that this is a movie that’s best left to just enjoy for what it is without reading too much into everything that happens. That may sound odd to read, but the suspension of disbelief for this cautionary tale will help in how much entertainment it delivers your way. Now that may sound like an excuse of sorts, but it’s more to let you know in advance that this is just a silly, fun movie that can be creepy, but is also something that if you think about it too much you’ll start to pick it apart in ways that would be hard to defend from a storytelling perspective. It’s best to just view Dark Web as an interesting horror concept revisited and executed well enough that it should keep most in the mood for some mindless thrills and chills entertained for 90-minutes. The story centers around Matias (Colin Woodell,) who logs on to a new laptop he picked up for the first time as the movie begins. He connects to Facetime for game night with his friends, while also jumping back and forth to Facebook in an attempt to resolve a fight that he and his deaf girlfriend, Amaya (Stephanie Nogeuras) are in the middle of. While doing this he starts receiving messages from some sketchy sounding people, as well as someone who threatens him for stealing their laptop. This leads Matias down a rabbit hole leading to the dark web, and once his friends find out what Matias has discovered on his new laptop, all their lives are now at risk from an unknown assailant who will stop at nothing to get his property back. What I love about the concept of the Unfriended films are how connected to technology we are that it’s completely natural to just have your entire TV screen be a giant desktop where we watch Matias Alt+Tab from Face Time to Facebook to various folders on his computer. It engages the audience and it’s just a fun idea that I’m happy to see return in Dark Web. While there are a few slower moments we have to sit through as the story builds up, Dark Web does a good job at keeping things well-paced and interesting, greatly in part to the direction of writer/director Stephen Susco and the actors involved. While one would think it’d be easy to just act like you’re hanging out with friends on Face Time, it’d be even easier to do it poorly, which would just make the movie unwatchable. Woodell, Nogeuras, and Matias’s friends Nari (Betty Gabriel), Serena (Rebecca Rittenhouse), Damon (Andrew Lees), Lexx (Savira Windyani) and AJ (Connor Del Rio) all keep things full of energy when it’s supposed to seem like they’re all just hanging out, as well as handling the scarier aspects of things once the cat is out of the bag. If Unfriended: Dark Web is any indication where this franchise could go should it choose to continue, then I’m definitely on board for a third installment. While it’s not a movie that holds up well if an interrogation light is shone upon it, it definitely delivers in the creepy vibes and fun department for its duration, which is often all that those looking to watch a movie like this are looking for. The movie all takes place on a computer screen and it looks great. The video is purposely poor or grainy where it wants to be, and sharp and clean for the majority. You really get the sense that you’re listening in on this event taking place right before your eyes thanks to how well the video looks and the sound design as well. The soundtrack comes through clear when the lead character plays a song, and it doesn’t interfere with the dialogue, and the sound effects all come off so naturally that there’s no distraction on that front whatsoever. There was an interesting thing that Unfriended: Dark Web did during its theatrical release, and that was to have different endings play out at different screenings. From what I’ve heard there were two different endings, with one of them chosen as the definitive one for the Blu-ray release. I think the right choice was made for the final version, but the other one that was out there also would’ve have disappointed. There are three alternate endings to be found on the Blu-ray, the third of which is the second alternate ending from the theatrical run. The other two titled “Matias & Amaya” and “Matias” were much weaker, especially the “Matias & Amaya” ending. They’re all worth checking out, though you’ll likely fast-forward to the last couple of minutes, as each one is about seven minutes long so that the build-up to the ending remains intact. Universal Pictures Presents Unfriended: Dark Web. Written & Directed By: Stephen Susco. Starring: Colin Woodell, Stephanie Nogueras, Betty Gabriel, Rebecca Rittenhouse, Andrew Lees, Connor Del Rio, Savira Windyani. Running time: 92 Minutes. Rating: 14A. Released on Blu-ray: Oct. 16, 2018.